Overseeding services offered by TurfPride Lawncare in Kennesaw, GA include the use of premium grass seed, followed by aeration and regular watering for strong root systems. In combination with aeration, overseeding your cool-season lawn in the fall will create thick, green turf next spring! All cool-season lawns, which stay green year-round, require special attention every fall in order to maintain a healthy, full turf grass for the next growing season. Fescue and Kentucky Bluegrass lawns (2 varieties of cool-season turf) must be re-established from seed every fall to replace any barren or thin areas of your turf. Cool-season grasses are best seeded from mid-August to mid-October in order for new seed to germinate and for plants to establish a strong root system before winter. Watering after aeration and overseeding is critical for the first 7 to 10 days in order for root systems to become established. We use premium seed that is only sold through professional lawn care services and only available through our company in the Atlanta area. Our seed’s Gold Tag certification signifies that it has less than 0.5% weeds and has higher germination levels than grass seed available via other lawn care services and in retail locations. 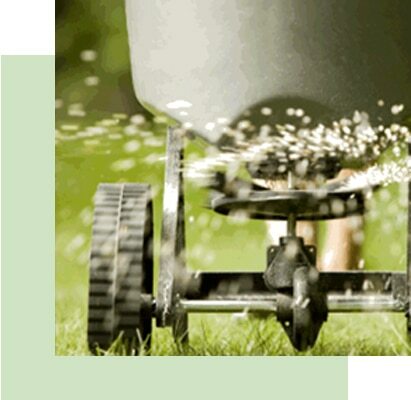 Aeration and seeding are recommended in combination for best results in seed germination. Is your lawn looking really patchy and unhealthy? Our diagnostic lawn services can help you find out the exact problem. Call us for details.